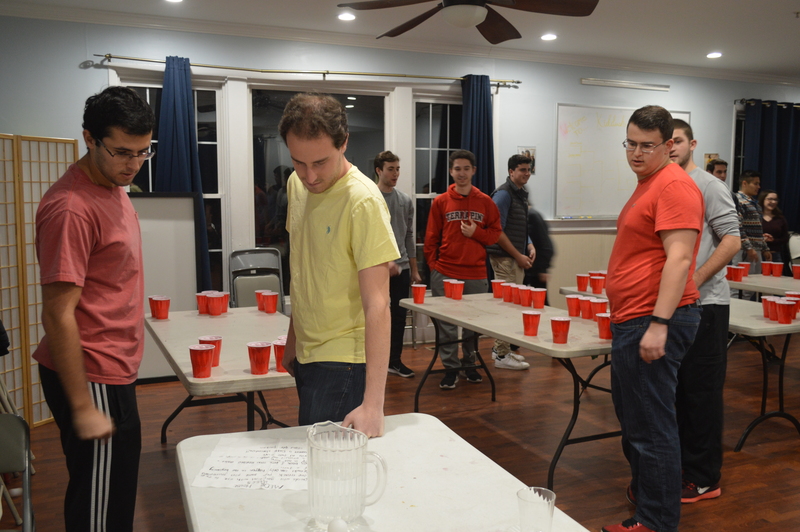 MEOR Maryland hosted a grape juice pong tournament Sunday night at “The Box,” MEOR’s home on campus, on Knox Road. According to its website, MEOR is “a home away from home” for Jewish students on campus to commune, share Shabbat meals, and engage with each other. Senior criminology and criminal justice major Kendall Goldstein was one of the student board members of MEOR who helped organize the Kiddush Cup! grape juice pong tournament. “A lot of people in the Jewish community have been telling that they wanted more events with MEOR instead of learning programs so I’m just trying to make sure we fit that need this semester,” said Goldstein. The Kiddush Cup! grape juice pong tournament was suggested by board members last year and Goldstein wanted to make that idea come to life this semester. “The board actually planned this last year and I thought that it would be really fun,” she said. Goldstein said the event was very inexpensive to host. 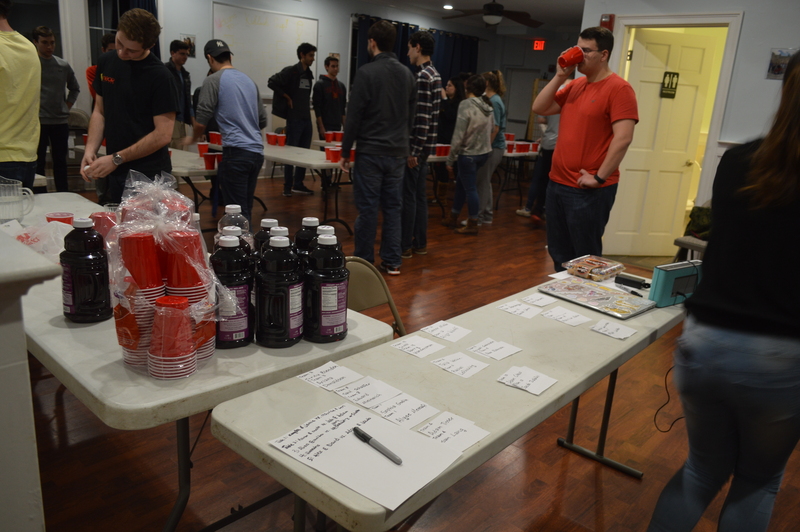 While the event was cheap, the grape juice used during the pong tournament was very symbolic. “There is a cup that you bless the grape juice, and then you pass it around and everybody drinks from it and that’s called the Kiddush cup,” said Goldstein. MEOR’s Kiddush Cup! tournament consisted of sixteen teams that competed for the ultimate $100 cash prize. Jasmine Boyd/Mitzpeh. In the Jewish community, at Shabbat, there is a Kiddush cup that is filled with wine or grape juice that is blessed by everyone at the dinner. “And so, us calling the event that was a play on words and us having the grape juice as the prize was based on that,” said Goldstein. The event was held in an intimate setting with about sixteen teams total who came out to compete. There were about six long tables lined up next to each other with a set of red cups organized in the shape of a pyramid on the far end of each of the tables. Each team consisted of two people and the rules of the original beer pong game applied in this tournament. There was grape juice, red cups, white ping pong balls, and good music. Some students came out to the event just to have a good time with their fellow Jewish peers. “I’m a big fan of MEOR! I come to their Shabbat dinners every night and they don’t have many of these house parties in a way,” said junior computer engineering major Harry Wandersman. While Wandersman, is familiar with MEOR, he said he chose to come to this event solely for the communion amongst his peers and he even got to meet new ones in the process. He said his favorite part of the tournament was “just seeing everybody he knew, meeting new people, and being able to play as many games as he wanted to” during the event. Senior finance major Ben Binyaminov (left) and senior marketing major Maurice Naim (right) were announced the winners of MEOR’s Kiddush Cup! tournament Sunday night. Jasmine Boyd/Mitzpeh. He described the setting as one that was open for fitting for friends to come together, play pong, and have fun while they’re doing it. “They had a really good atmosphere with music and some food, so it was just a lot of fun,” said Wandersman. As the tournament progressed, members of the board committee kept tabs on the teams who would ultimately advance to the final round. The team that won the tournament consisted of senior finance major Ben Binyaminov and senior marketing major Maurice Naim. Both Binyaminov and Niam entered the pong tournament with attitudes of confidence in knowing that they were going to win. The winners of the pong tournament were collectively awarded $100 cash, each a bottle of grape juice and an imitation gold medal by members of the student board. No Replies to "MEOR Kiddush Cup: a traditional spin on a classic college game"